Conservative Happenings: Barack and Hillary accuse The Donald of Being Them! Barack and Hillary accuse The Donald of Being Them! ‘The Totalitarian State of Not Being Able to Be’ is upon us. 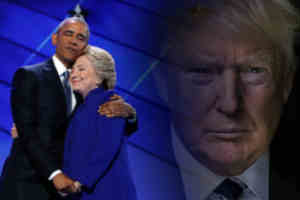 Read their lips if you’ve got the stomach to do so: Barack and Hillary not only love America, it’s the Love Affair of the Century. An identity theft started by President Barack Obama was completed by Hillary Clinton at her last night nomination acceptance speech. Donald J. Trump, the populist folk hero millions want to see in the Oval Office, has had his identity stolen by Barack and Hillary. Just like Islamic terrorism, he was only a figment of our imagination. The Totalitarian State of Not Being Able to Be’ is now the lay, if not the law, of the land. Well hidden under progressive policies disguised as “Good for all”, it’s not yet as glaringly recognizable as all those totalitarian states that came before, but it’s making speedy headway toward a civil society where freedom and liberty will be filed away in the Distant Memories Folder. In case you haven’t yet noticed, you are no longer permitted to be a patriot without being identified as a Xenophobe. You are deemed as “unreasonable” for wanting protection for your children in public school washrooms without being categorized as a bigoted anti-LGBTQ revolutionary. You are not permitted to be leery about ‘refugees’ flooding your town or city without being labeled an Islamophobe. Acting like the latter will get you thrown off Facebook and Twitter, and the day is not far off when it will come with a prison term. What If Martin O'Malley or Bernie Sanders Disobeys the DNC on Debates? (c)Conservative Happenings 2015 Support our Advertisers. Powered by Blogger.